Daniell's complete journey round Great Britain, starting and finishing at Land’s End, was accomplished in six separate excursions over the period 1813 to 1823. The third of these took place in 1815. Daniell left his home in London in May and travelled north to Wigton, to continue his journey up the west coast of Scotland, finally returning in October, having travelled around the north coast of Scotland and down the east coast as far as Dundee. This journey provided enough sketches to keep Daniell occupied in London for the next six years. Daniell’s dates are rather unreliable. Up to 5 years could elapse between his travel and his writing the final text and completing the final prints! Over a period in August and September 1815 it is likely that he covered the part of the journey from Thurso to Banff. Although we are not sure of dates, we can be sure of his itinerary. 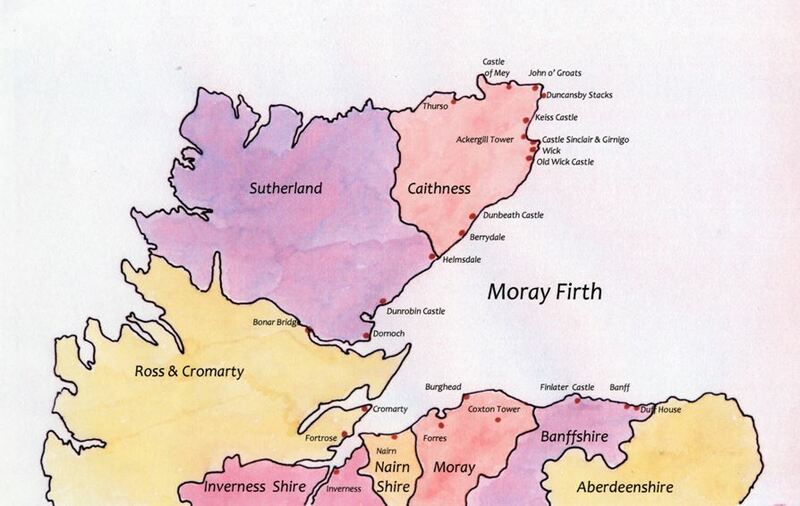 It is shown on the map, which indicates the Counties in the north of Scotland in 1815. The red spots on the map indicate the locations of the prints reproduced in this book. The journey encompassed a broad set of landscapes, from the towering cliffs in Caithness to the sandy shores and modest cliffs from Inverness to Banff. His journey in 1815 continued longer than he had anticipated due to the very kind weather. From this journey in 1815 Daniell produced a total of 139 aquatint prints, the last of which were published in 1822.